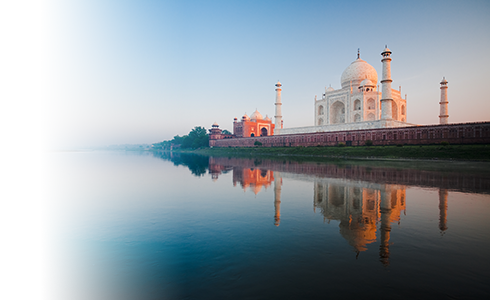 Find out more about how our travel insurance can cover your holiday to India. When you’re ready, get a quote online or talk to our friendly team today. India is a country rich in history, landscape and culture. It’s always worth having proper travel insurance when going to India, so that when you set off on your travels, you’re well-protected against unexpected holiday mishaps. Buying a tailored policy will mean you can be covered for all your medical and travel needs, at the level that suits you. Our customers seem to find it works. After all, we’ve been voted the UK’s Most Trusted Travel Insurance Provider*. We think you’ll agree with us that it’s worth doing right. You can get your tailored quote for your travels to India online today, or talk to us now on 0800 033 4902. Why do I need travel insurance for India? Travel insurance for India is a must. Going uninsured means you will have to pay out for any mishaps that may arise while you’re away. From the Taj Mahal to a journey to the Himalayas, isn’t it best to enjoy India with peace of mind? You can be assured that if anything goes wrong when you’re away, you have our support. You can get your tailored quote for travel insurance to India online here, or pick up the phone and talk to us today on 0800 033 4902. Can I get free healthcare in India? Unfortunately, free healthcare is not available in India. The UK and India don’t have a reciprocal healthcare arrangement, and India is not covered by the EHIC. But having proper travel insurance in place will cover you for any treatment you might need when you’re travelling. Plus, our multilingual 24-hour medical assistance team offers valuable emergency support in English. They are specially trained to deal with any medical arrangements you may need to make in India, and their round-the-clock service removes the hassle of having to call them at odd hours from a different time zone. If you have any pre-existing medical conditions, we’ll need you to complete our medical screening process. The medical screening takes little time and is designed for us to understand how your medical condition(s) affect you personally. You’ll be asked a few straight-forward, multiple choice question about any pre-existing conditions you have. We’ll need the answers you give us to be as accurate and complete as possible. It may be helpful to have your medical history to hand during the process. We must emphasise that if you have a medical condition and it hasn’t been declared in your policy, then in the event of a claim you may not actually be covered. So it’s worth doing right. Which questions will I be asked? How long have you had this medical condition? Have you recently been treated with surgery? You can complete the medical screening online, but if you’d prefer some help with it, the process can be completed over the phone with a member of our friendly team. You can get your tailored quote online now or call us 0800 033 4902. I’ve already bought my policy. Can I make changes to it? Almost certainly. If there’s a change to your health or you want to add an additional activity to your trip, then please let us know as soon as possible. We can’t guarantee it in all cases, but usually we will be able to adjust your coverage for an additional premium. But we must know about any changes in advance, otherwise your policy won’t cover you properly if you need it. Please note that while we can increase your level of cover after you have bought your policy, we cannot reduce it subsequently. So do check that you are happy with your level of cover when you buy your travel insurance policy from us. Do I need vaccinations to visit India? The government’s travel advice pages recommend you visit your doctor or health professional about four to six weeks before your trip, to check whether you need to take any vaccinations or other preventive measures before your trip. Will I need a visa when travelling to India? A visa is needed when travelling to India. British passport holders who meet the eligibility criteria can apply for a double entry e-Tourist Visa (e-TV) to enter India at certain designated airports. You can find more information about the eligibility criteria on the government of India’s e-Tourist Visa website. Get a tailored quote for you and your family’s medical and travel needs today.